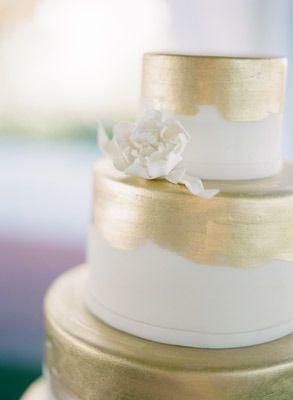 So you love the color gold and you know this will be one of your wedding colors but you’re not sure about the others. 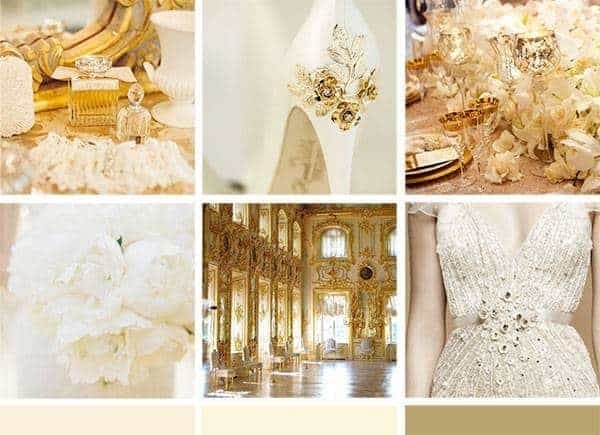 I want to share gold wedding color palette along with some tips on your wedding color palette especially for choosing a great companion color for gold. 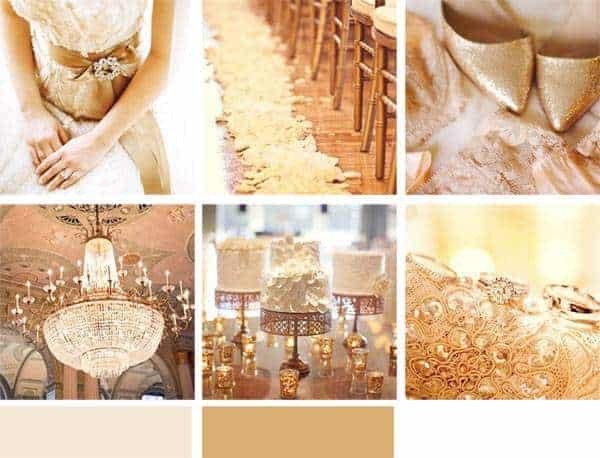 Below are 10+ examples of colors that goes with gold that gives you a gorgeous gold palette for your wedding. One way to ensure that your wedding colors are striking is to choose a color that contrasts well, or shows up very well next to gold. Think about it – while yellow would get lost next to gold, crimson would stand out wonderfully. 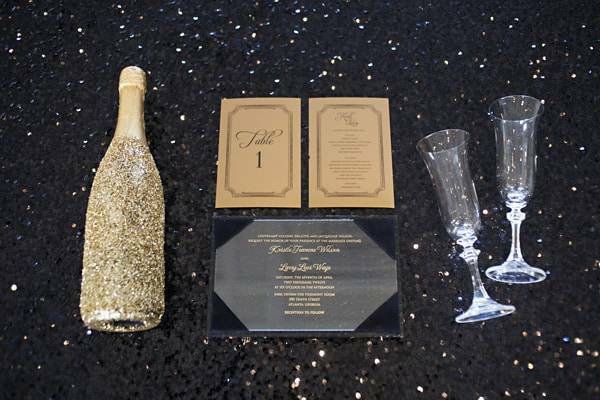 As far as wedding gold pallets are concerned, black and gold works great for a black tie evening wedding, and adds a 1920’s art deco feel to the party. 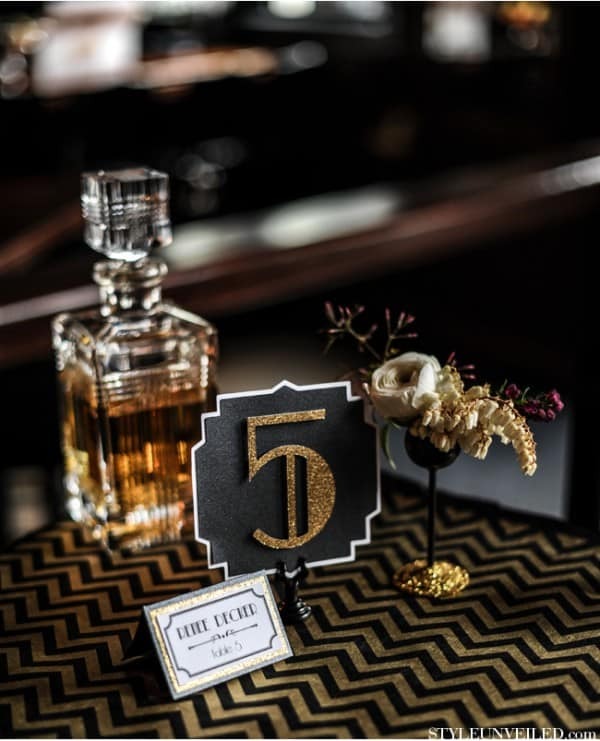 Black and gold together is great for a Gatsby-themed wedding. Lots of gold accents against a black backdrop gives loads of high-class drama, creating a strong visual impact. One of the gold pallets that’s very popular right now is rose and gold. These two colors together brings to mind a lush vintage feel reminiscent of the Victorian era. Super feminine yet big on drama, rose and gold create a color palette that works great year round. 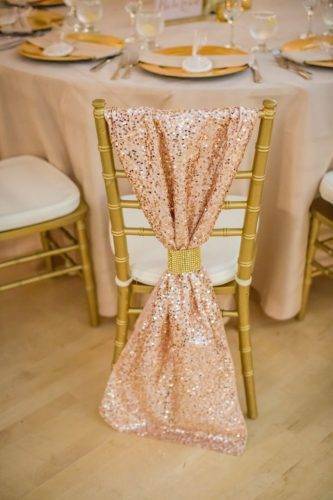 Try bringing these two colors together with gold candlesticks, rose-colored flowers and rose sequin table runners. 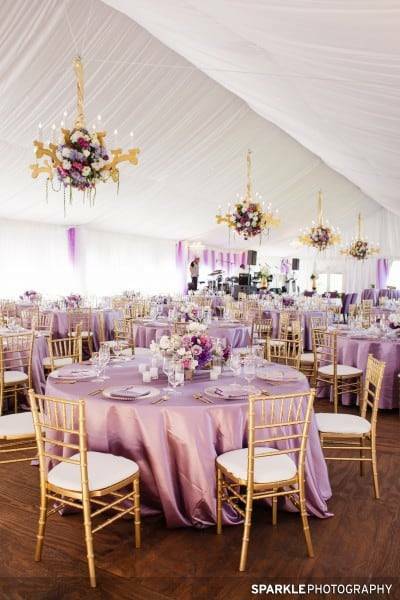 Perfect for a Springtime garden-themed wedding, lavender and gold together create an incredibly feminine, delicate look. 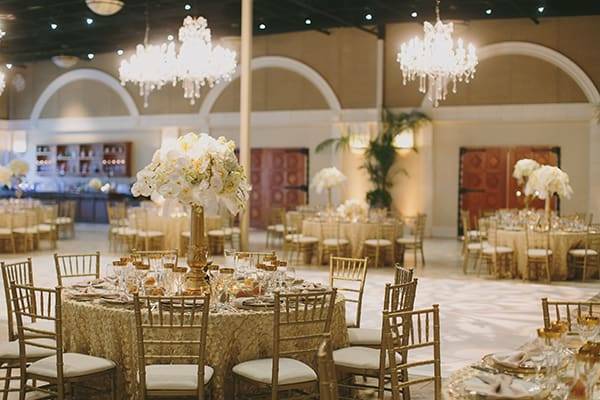 Loads of lush delicate flowers in gold vases create an ethereal enchanted garden mood, and your guests will feel like they’ve entered a beautiful vintage garden. 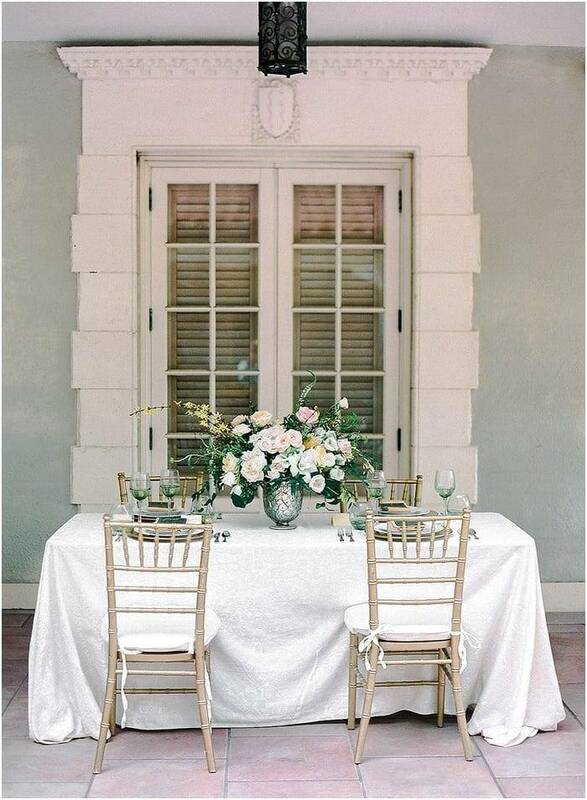 Incorporate some white florals and lush greenery to add to the beautiful Springtime theme. 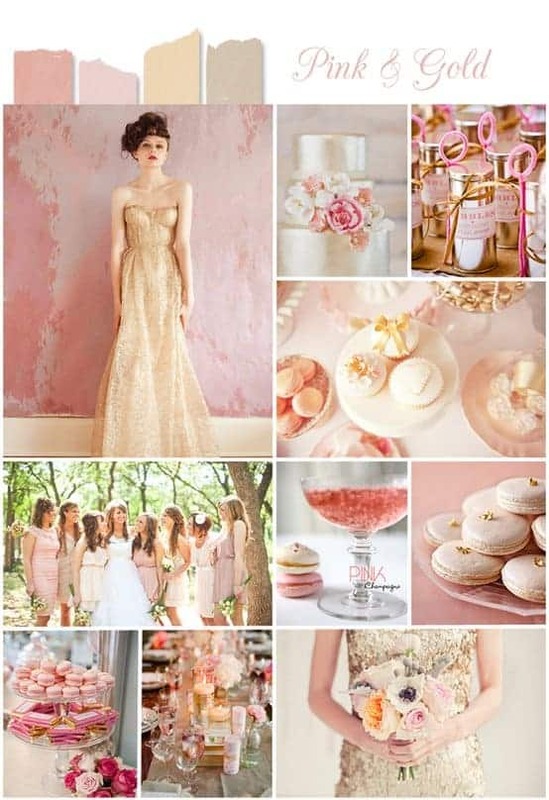 Similar to rose and gold, the combination of blush and gold brings an enormous amount of femininity to your wedding. 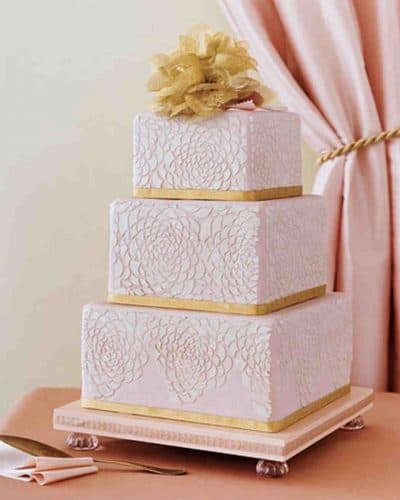 Blush is delicate and muted, while gold elevates the look to add lots of elegant drama. 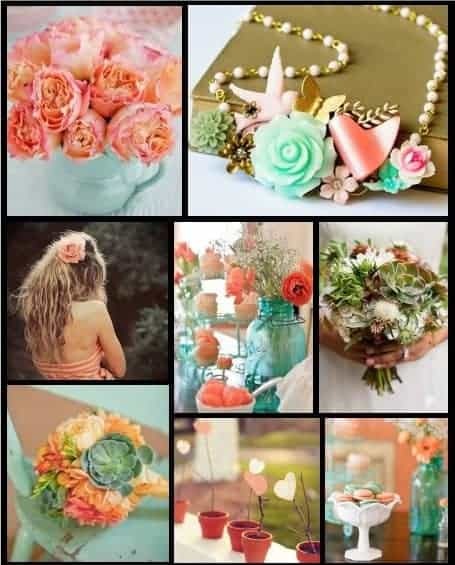 This color combination is ideal for a Summer wedding, especially if it’s outdoors. 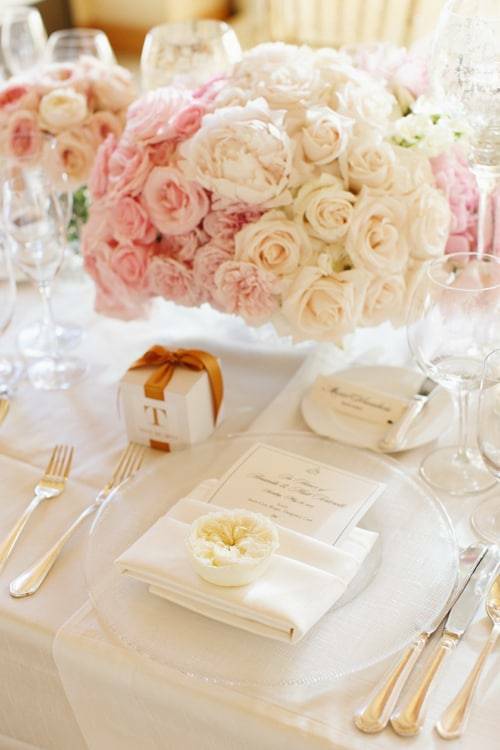 Blush flowers such as peonies and garden roses look stunning as centerpieces, with gold chairs balancing out the color scheme. 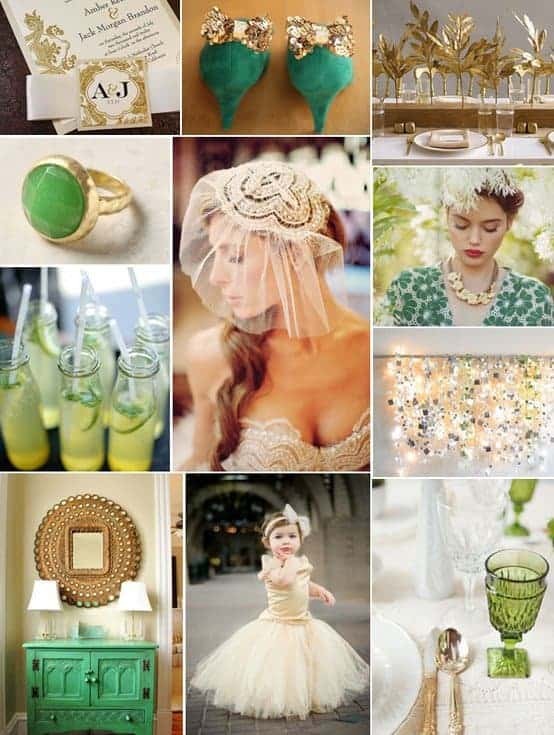 Of all the wedding gold pallets, maybe emerald and gold together evoke the most images of royalty. These bold colors are a great alternative to the more delicate colors we associate with Summertime weddings, and guests will be delighted by the unexpected colors. 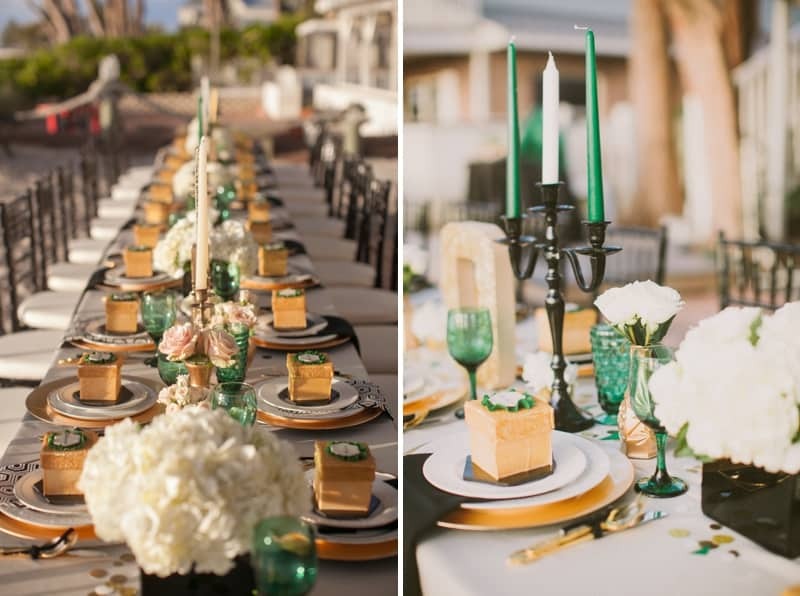 Lots of gold candlesticks and lush greenery bring this look together. 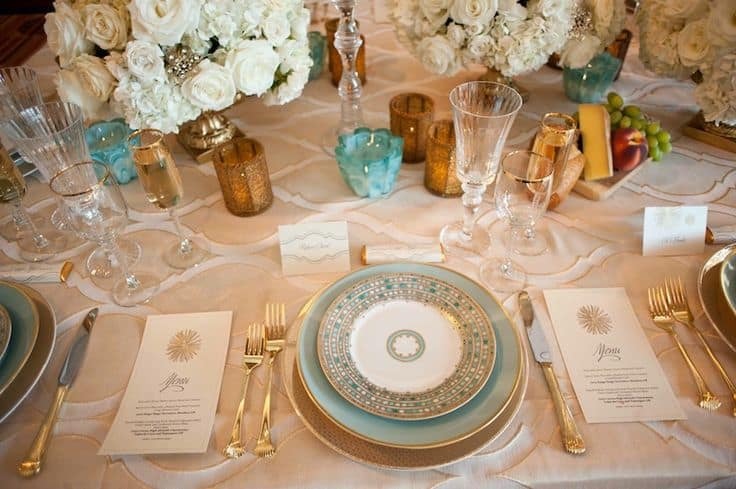 Emerald green napkins and gold silverware make great added details. 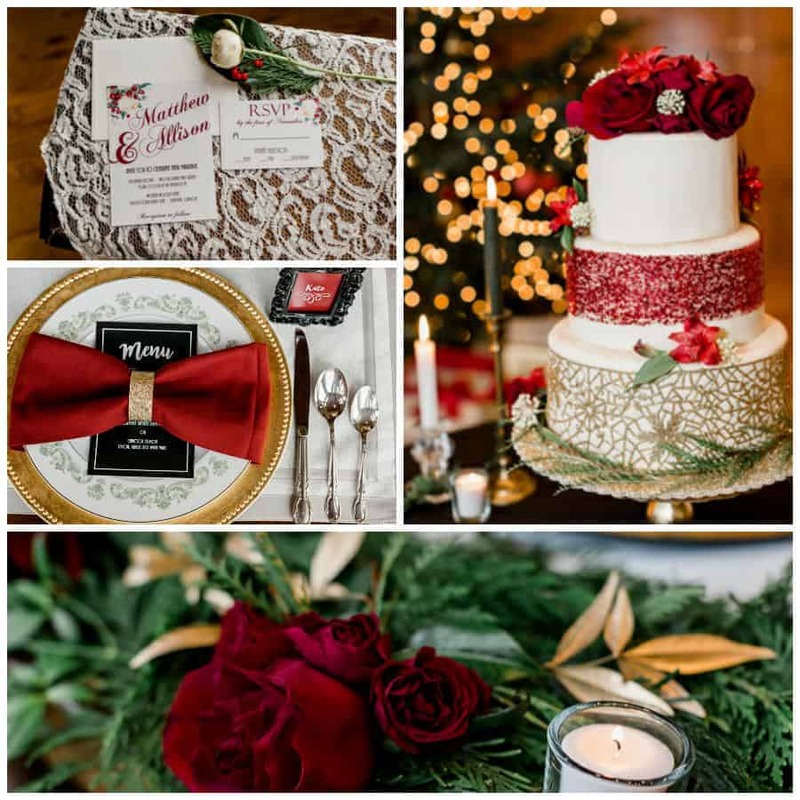 In terms of what colors go with gold, if it’s a wedding that’s scheduled around the Holidays, crimson and gold makes a huge impact as well as delivers elegant Holiday cheer. These two colors together bring to mind images of the Holidays, and their rich, warm hues put together add lots of drama. 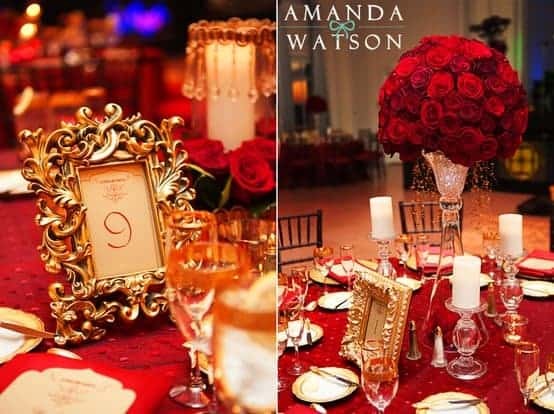 Red roses and gold charger plates work great together for the table decor. 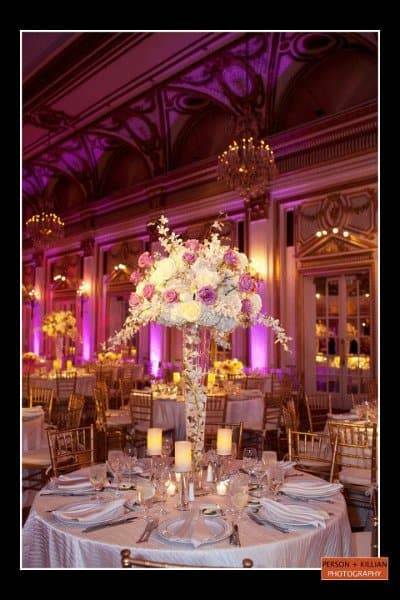 Scattered rose petals make great accents throughout the room, as do grand gold candelabras. 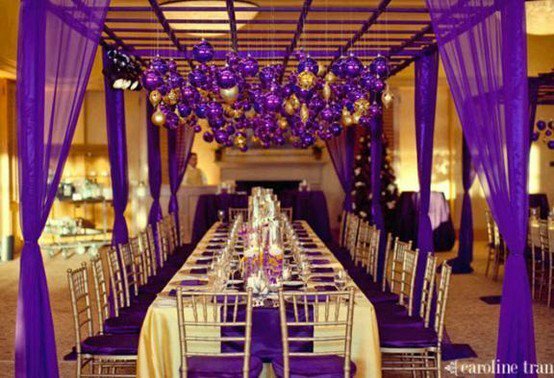 Purple and golds together create a high-impact visual that evokes feelings of luxury and glamour. Putting these two bold colors together is not for the faint of heart, and works really well for indoor spaces and evening weddings. 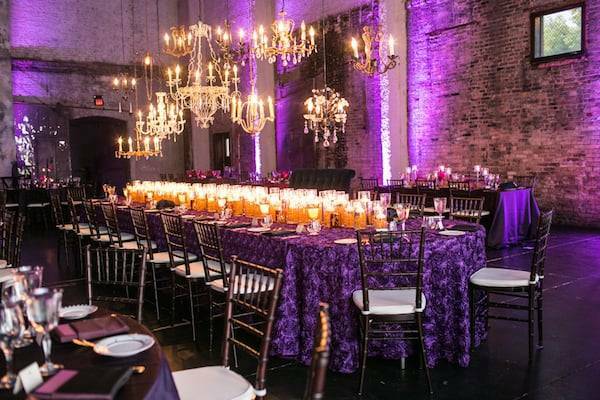 Dramatic purple up-lighting and tall gold vase centerpieces bring high-end glamour to any space. 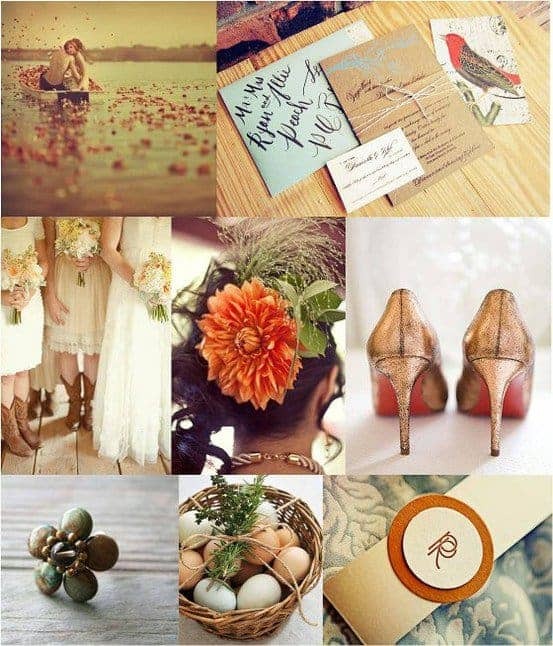 Having an Autumn wedding? Among all the colors that go with gold, orange and gold is a tried and true color palette perfect for the Fall season. 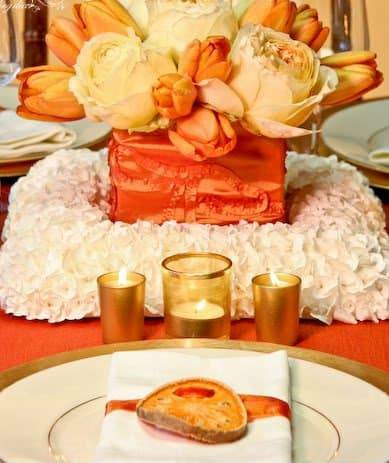 Think centerpieces decorated with pumpkins, faux Autumn leaves and gold candlesticks or vases. 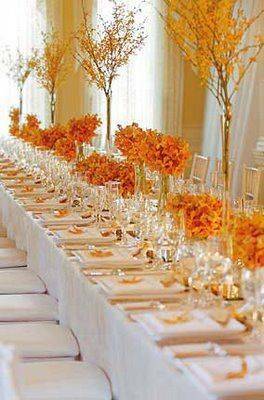 You’ll create an Autumn wonderland for your guests! Let the color gold really shine against a white backdrop. These two colors together creates a super minimal yet glam vibe, with guests taken aback by the mood of luxury you’ve created. 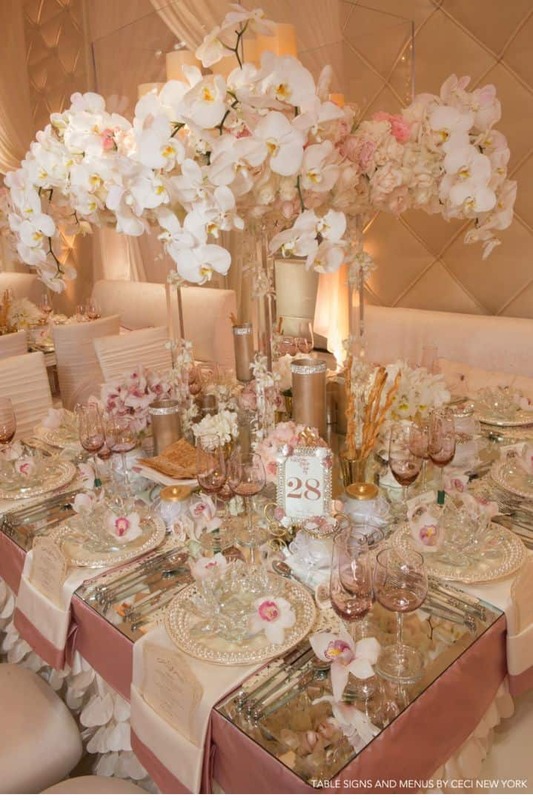 White flowers like lilies and orchids look super glamorous against gold sequined tablecloths or table runners. For a seriously vintage feel, combine luxurious gold with hues of baby blue. 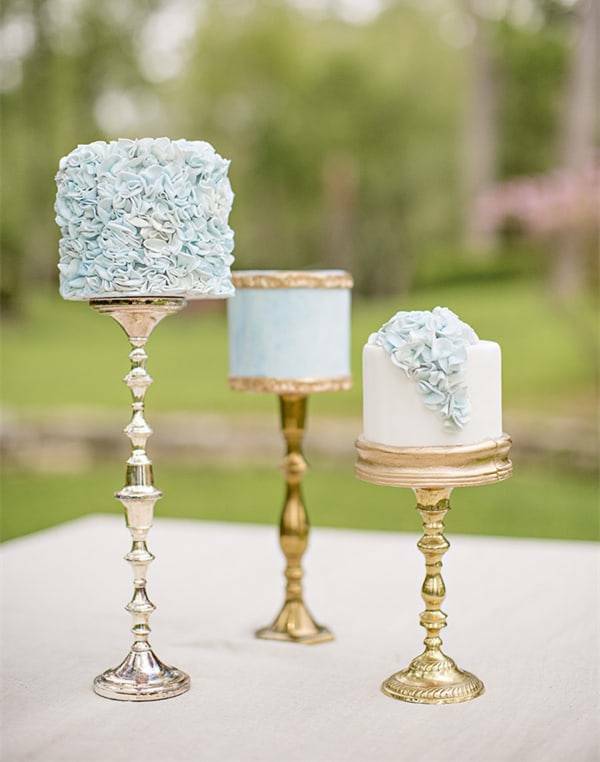 Think antique gold-rimmed baby blue china, gold silverware and delicate baby blue flowers. 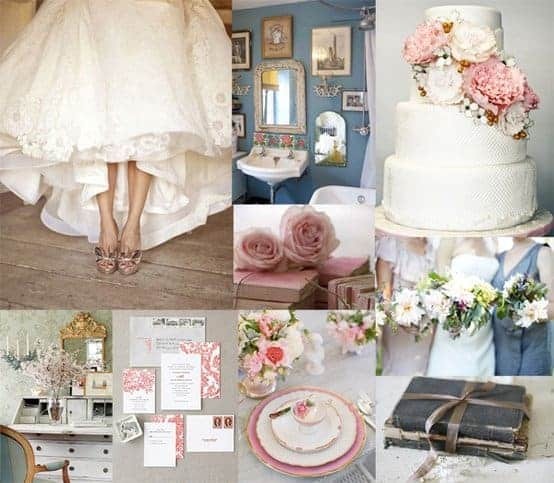 Great for a Spring wedding, this color combination is elegant without being over-the-top feminine. Different gold color palettes can evoke all kinds of different moods and atmospheres for your wedding. 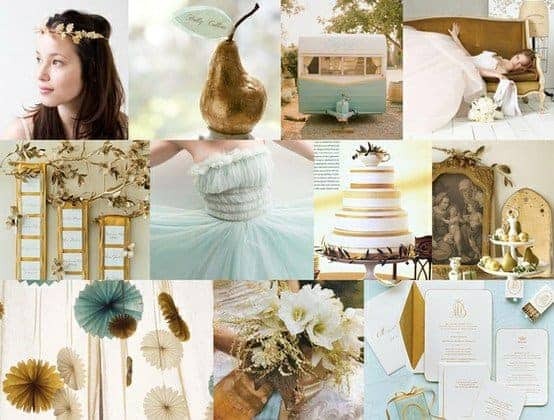 Whether you’re going for a delicate, feminine vintage mood or an ultra-dramatic glamour vibe, gold is a highly versatile color that can tie all your visual elements together. The best companion colors for gold are dark purple, emerald green, rose pink, red, cream, and dark blue. If you want to make things even more interesting, use three colors and include gold. 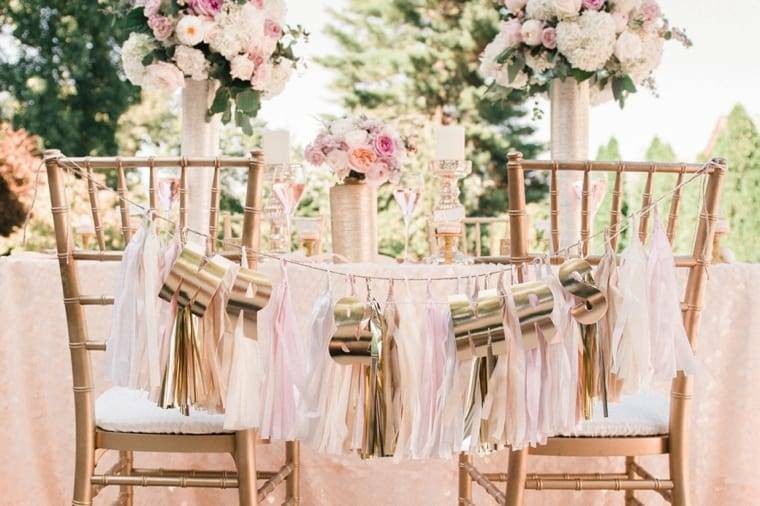 For instance, pale green, flower petal pink and gold are wonderful colors together and can come together to create a breathtaking wedding. Gold can clash with a few colors, even though it is a color that goes with most colors. Gold and yellow are not great choices and gold doesn’t go with any neon color. Gold and brown can look charming, but can also be depressing with no pops of brighter color. 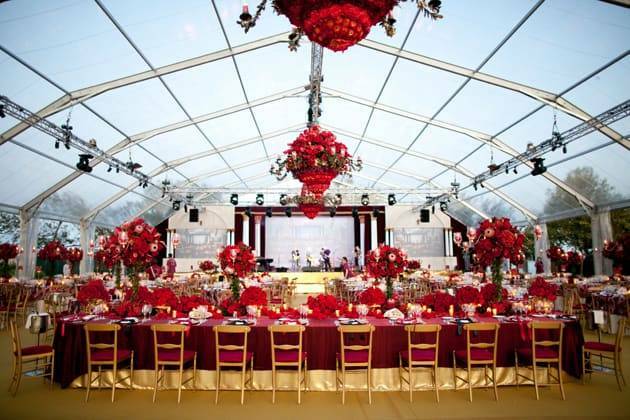 Gold is a wonderful wedding color and can help make your wedding look splendid. Use these tips to determine the perfect companion colors. I hope you enjoyed this article, and please share the link and leave a comment about your favorite gold color palette! @Rockell Glad that you love this! Tune in for more inspiration! Baby blue works for me. My favourite combination will be gold and crimson. But I am wondering if a splash of rose pink with the combo will be even more fabulous? this has helped me am using red and gold for my wedding which is in November and wanted if they look awesome.